i Field of ViewThe area your camera will capture. Model - BigShot-HD PT includes: USB 2.0 “plug & play” full size pan & tilt HD camera with 2.5mm wide angle lens and remote control. Compatible with all known PCs and mobile devices with a USB camera connection. 360 degree pan & 120 degree tilt, 1/3” CMOS high speed image sensor, MJPEG - 1080P(1920*1080), 720P(1280*720), VGA(640*480), CIF(352*288). IR advanced function remote - controls 4 cameras with pan tilt speed control, 10 presets, reverse mirror image layout function, reverse upside down or right side up image function for ceiling mount (E-Flip, Invert, Mirror). Desktop, wall, tripod or ceiling mount. PTZ control - VISCA, Pelco P & Pelco D. One year return to VueQuest warranty. Camera dimensions are 9 1/2"W X 3 3/4"D X 5 3/4"H @ 3 ½ pounds. The BigShot-HD PT is a pan & tilt only camera with a wide angle lens for full room coverage – no zoom control. Packaging includes camera, remote, power cord, ceiling mount bracket, 16' USB cable , Visca to RS232 cable, quick start guide, and user manual. Model - BigShot-HD PTZ 3X includes: USB 2.0 “plug & play” full size pan, tilt & zoom (PTZ) HD Video Conferencing camera with remote control. 1/3” CMOS high speed image sensor, f=3.8-38.0mm, F1.8 lens. Illumination -regular: 1Lux; night: 0.1Lux (infra LED off), 0Lux (infra LED on). Compatible with all known PC's and mobile devices with USB camera connection. 360 degree pan, 120 degree tilt & 3X optical zoom, auto and manual focus, MJPEG - 720P(1280*720), VGA(640*480), CIF(352*2880). IR advanced function remote controls 4 cameras with pan tilt & zoom, variable speed control, 10 presets, backlight control, image freeze and data screen functions, reverse mirror image layout function, reverse upside down or right side up image function for ceiling mount (E-Flip, Invert, Mirror). 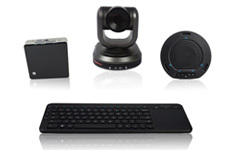 Desktop, wall mount, tripod or ceiling mount. PTZ control - VISCA, Pelco P & Pelco D. One year return to VueQuest warranty. Camera dimensions are 9 1/2"W X 3 3/4"D X 5 3/4"H @ 3 ½ pounds. Packaging includes camera, remote, power cord, ceiling mount bracket, 16' USB Cable , Visca to RS232 cable, quick start guide, and user manual. i USB 3.010x faster than USB 2.0. Remote MenuBacklight control, image freeze and data screen functions. Low-light CMOS, adaptive brightness adjustment 1080P format for high-definition output USB2.0 digital interface, driver free installation Low CPU utilization. 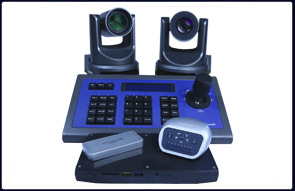 FPF focus control mode, (locks the focus point image) Manual fine-tuning focus via remote Compatible with the majority of videoconferencing software. Supports Linux and Android as well as Mac iOS Infrared remote control operation, effective distance 7m. Supports RS232 serial control. Supports UVC FECC. Lens area: 1 / 2.7 ". Effective pixels: 1920x1080 Pixels. Zoom: 12x zoom lens. Focal length: 4.0 ~ 48.0 mm. Lens angle: maximum 43 °, minimum 7 ° Video format: MJPG, 1080P, 720P, 1280x720, 640x480,VGA, CIF, QCIF. Pan: 300 ° left to right. Tilt: 90 °. Dimensions: W90 x L110 x H105 . 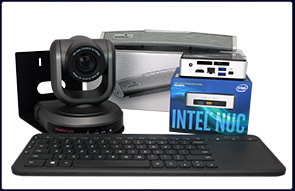 i USB 3.0 & DVI-IOuputs are simultaneuos for dual purpose video conferencing.